Earlier in the week, they received their 22.5 inches of hardware that's what she said? but the most recent Sudler Trophy winners were not content to rest on their laurels. While the Third Saturday in September hasn't meant what it once did when Tennessee was providing more competition, a rivalry is a rivalry, and the Gator Band came to play. While I didn't see a ton of the game, I did see and hear that even with the visiting Pride of the Southland there, the Pride of the Sunshine put in work. From oranges to apples, my open playbook high note was the Apple Fest in Bethabara Park in Winston-Salem. I love fall for more than just football and marching band, and it was good to see the apple celebrated when folks tend to rush the pumpkin the moment Labor Day hits. 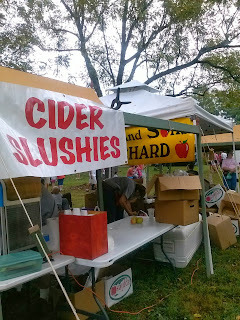 As you may guess, the Apple Fest featured all sorts of apple treats, fresh picked apples for sale, BBQ (because North Carolina) and among the activities the racin' pigs of the Hogway Speedway.